LV (Jane Horrocks) is a painfully shy girl living with her horrible, shouty mother Mari (Brenda Blethyn). LV escapes into the world of her the records that her now-dead father left her – all the classics, Shirly Bassey, Judy Garland, Billie Holiday – all the greats. When her mum hooks up with local talent scout Ray Say (Michael Caine) and he hears LV singing, a plan is cooked up for her to become a star. Not that she wants it. Meanwhile, she has met equally shy pigeon fancier Billy (Ewan McGregor) and he has lit something in her. I love this film. It’s one of those great little British films that tell a decent story with strong scriptwriting and fabulous performances. Jane Horrocks is just so fabulous in it, especially once she is in the spotlight! Bam! But it is a tough film to watch. So much awfulness. The one bit that falls down for me is the role of the unattractive neighbour Sadie, played by Annette Badland. Her character is mostly silent and acting like a moron like a poor clown. The thing is, the film didn’t need a clown – it was such a tragic film and Sadie was not an appropriate inclusion. Annette Badland would have done a lot better as a strong supporting character. 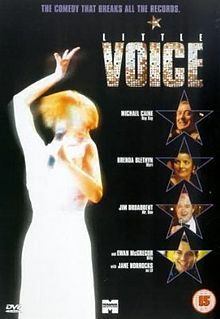 Little Voice was nominated for an Oscar for Best Actress in a Supporting Role (Brenda Blethyn). Absolutely love this movie Marg! Thanks for giving it the credit it deserves.. I was slightly fearful about watching it again in case it didn’t hold up. But it totally did!